For the last decade, in the Shared Consciousness series, I’ve been exploring the empathic connection between humans and other species sensed in moments of stillness. 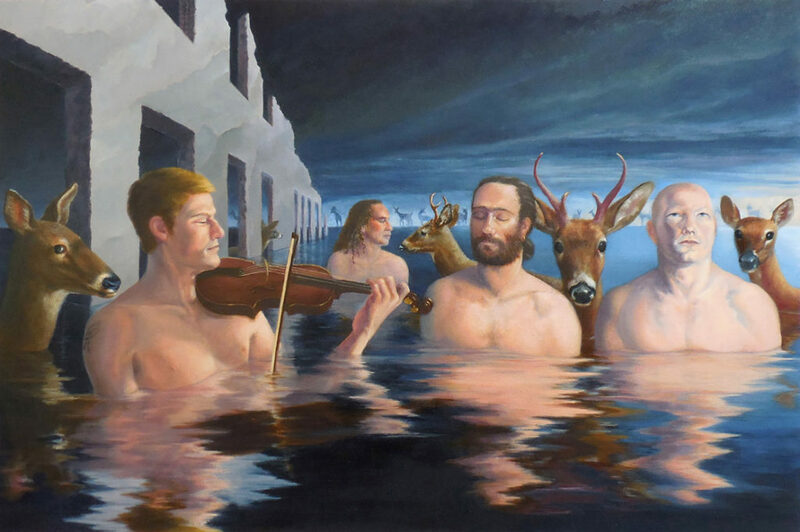 In these paintings, this nonverbal, primal link lies just below the surface of awareness as it flows through psychological and spiritual levels in a watery landscape on the brink of devastating climate disruption. Contemporary models and wildlife warn of catastrophes to come with a shared sense of dread. Setting everyone in water deepens the mystery and provides myriad possibilities for metaphor. It emphasizes the individuality of each model by limiting distractions and focusing on faces rather than bodies. Portraying wildlife with as much empathy and dignity as the humans who sit for me is one of my primary concerns. In this series, other species may become messengers from the spirit world, messengers from the unconscious, or messengers from Nature seeking to communicate with us. This is a world where arrays of familiar and diverse elements unite to form extraordinary circumstances, where an exterior narrative is no more unlikely than its interior counterpart, where other species conduct us to unseen, unfamiliar, or perhaps familiar, realms. 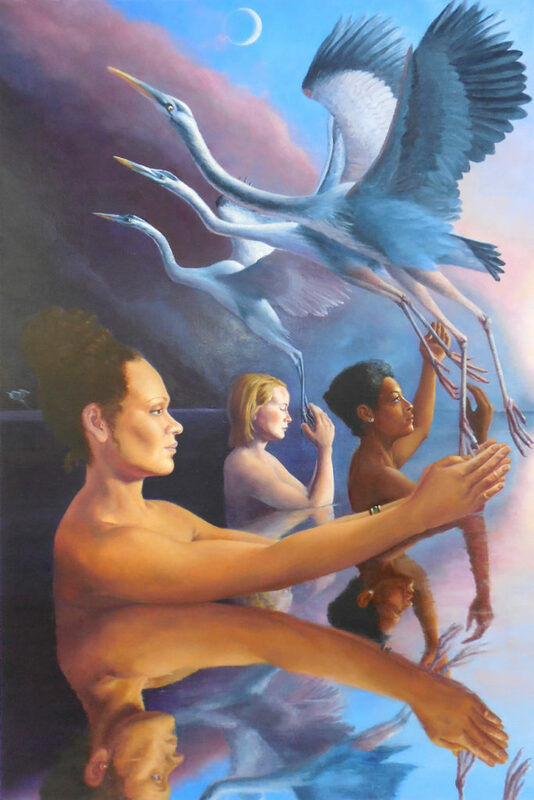 Sandra has a BA from Pace University, NY, studied at the Art Students League for seven years, and received an MFA in painting from the Graduate School of Figurative Art of the New York Academy of Art. 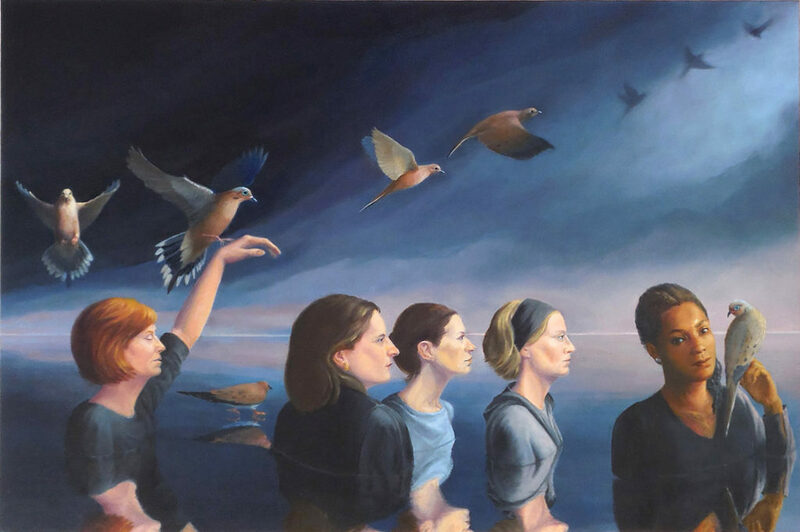 She has had numerous solo exhibitions over the years, and her paintings have been included in group exhibitions such as the Contemporary Realism Biennial, Fort Wayne Museum of Art, Indiana; the National Figurative Drawing & Painting Exhibition, Susquehanna University, Pennsylvania; Maine Women in the Visual Arts, Colby College Museum of Art, Waterville, Maine, and more. Born in New York City, she has been living and working in Maine for almost 30 years.